The Flour Mill is an exciting project aiming to restore the building to its former glory. Although it will still provide unique and cool co-working and office spaces right in the heart of Dundee. The team at the Flour Mill Dundee are excited and passionate about ensuring the heritage of the building remains. Consequently, part of our work to ensure this happens is to research and know the history. This blog digs into the timeline of the building starting in the 1800’s. 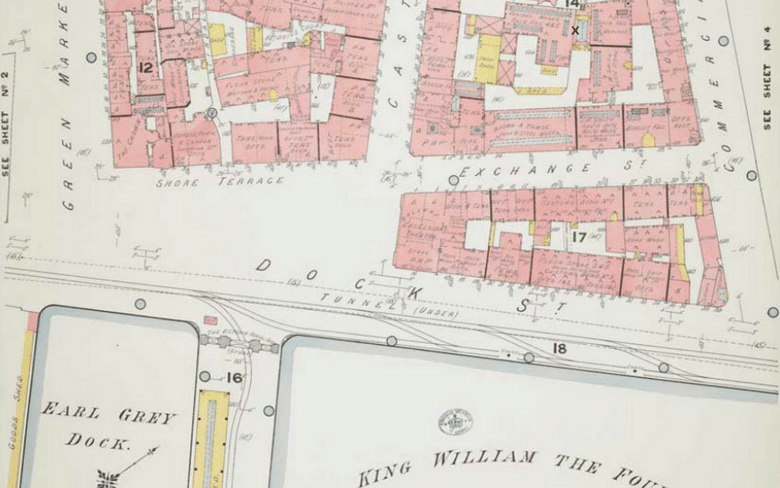 The industrial revolution in the 19th century, grew Scottish towns and cities vastly. Particularly notable is development of the textile, ship building and whaling industries. As a result, there was a vast increase in mills in Dundee. The city saw a substantial increase in population from around 26,000 people in 1801 to 166,000 people in 1840. Flour Mills were a great source of job opportunities. In the 19th century bread was a popular and key food source. The close in which the Flour Mill sits allowed easy access to the harbour and a burn close by. We believe the water was a vital power source. The Flour Mill was a much bigger building than it is now. The building was formerly 7-storey with an attic. It seems it was reduced to 5- storey in the later part of the 19th Century. The basement of the building is believed to date back to the 17th century, possibly earlier, the area being at the heart of medievil Dundee. It is believed that it may have been linked to Castle Hill house and it’s thread making works. The Car Park area in which the Flour Mill sits is the roof of the vaults discovered in Dundee. These vaults used to be the home of more winding streets and merchants that dates as far back as the 1700’s. There is currently limited access to the vaults due to safety reasons. Transportation of stock at this period was generally by horse and cart owned by the mill. The horses were kept in stables which is now, the ground floor of the Flour Mill. During the current works on the Flour Mill you can still see the structure of where the stables used to. We have a couple of newspaper advertisements dating back to 1863 with the sale of “a very handsome pony” and 1869 where Castle Flour Mills auctioned off their “very superior” horses, carts and harnesses. The first evidence of the struggles of Castle Flour Mills came to light in 1865 where the Mill was put up for let. The steam engine became a predominant form of power in Flour Mills in the 19th century during industrialisation. Power before, was sourced from wind and water until James Watt (Scottish Inventor) re-worked an original steam engine design and patented it making his idea a substantial contribution to the industrial revolution and huge improvements in the manufacture of flour. Some equipment from the steam engine can be still found in the Flour Mill. 1869, saw the bankruptcy of Jamieson and Castle Flour Mills due to heavy losses in 1867 and 1868. The equipment of the mill was sold off in auctions to cover the bankruptcy bills! The fall of the Flour Mill was likely due to technology innovation and cheaper foreign imports at the time.